Frozen chicken tenders from Trader Joe’s look like they’d be nothing special. But, they get my nomination for best ingredient of the year. Here’s why. I was once a skeptic. My sister suggested that I buy frozen chicken tenders from Trader Joe’s. I thought she was nuts. Until I tried them. Then I was hooked. Now at $7.49 for 2.5 pounds, these are certainly not the cheapest chicken you can buy. However, once I started buying these truly tender tenders, I realized we couldn’t go back. 1. Frozen chicken tenders are convenient. These chicken tenders (they sell thighs and breasts this way too) are ice-glazed, meaning they don’t stick to each other, and they come in resealable freezer bags. You only pull out the number that you want, one or ten. Did I mention there’s no need to thaw? Awesome. 2. These frozen chicken tenders are never tough. We really love this chicken at our house. 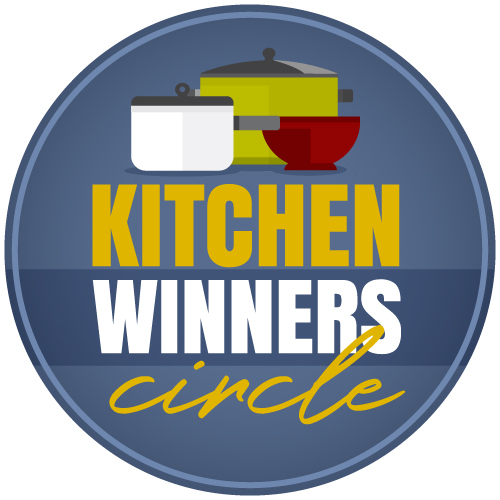 I’ve been cooking with them almost exclusively since I started recipe testing for Good Cheap Eats Dinner in 30 Minutes or Less! It was an easy way to have chicken on hand without worrying about thawing. My family loves them! I wondered if it was worth the extra money to be buying them from Trader Joe’s instead of getting sale chicken at the grocery store. I bought a few packages at the next good sale I saw. I cooked one and ended up taking the others back! These are so good, they’re worth their $2.99/pound. Promise. I don’t know what those other stores treat their chicken with; TJ’s says the same thing about up to 3% solution, but there is a difference. These frozen chicken tenders are never tough. No matter how long I forget them. 3. 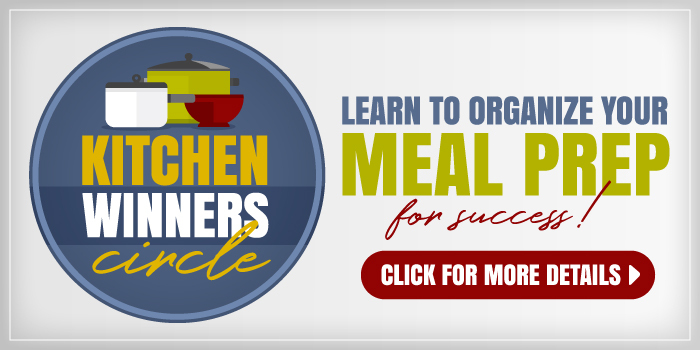 Frozen chicken tenders cook quickly — from frozen. Since you don’t need to thaw these, they are perfect for spur of the moment meals. 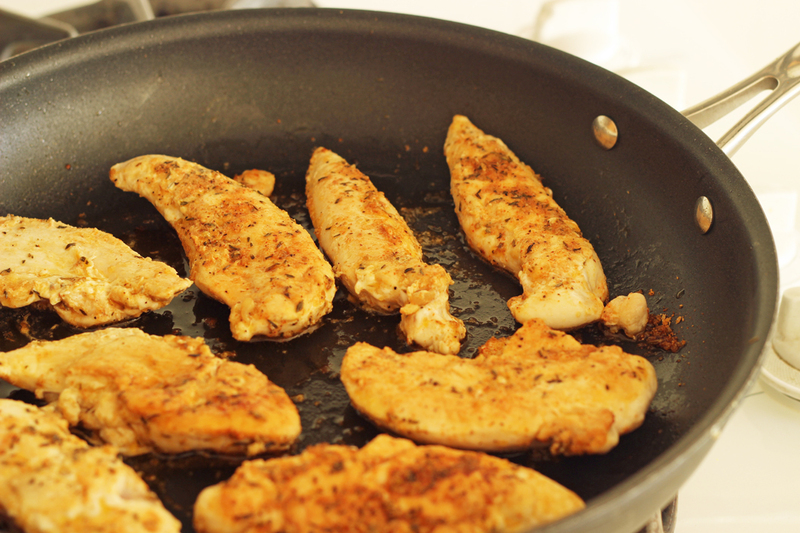 I heat some oil in a pan, add the frozen chicken tenders, season generously, and in fifteen minutes I’ve got a great meal. Not sure? 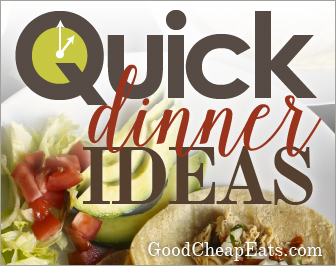 Just try one of these quick chicken recipes! I was a skeptic, but I’m now a believer. My kid sis knows a thing or two. I better keep listening to her! Have YOU tried frozen chicken tenders? Has anyone ever tried (and compared) the same product from Aldi’s? We don’t have a TJ’s near us, so I bought the frozen tenderloins from Aldi’s, instead. The ingredient list is small, they’re cheaper, and they cook up easily. I’m hooked, as well, but admittedly, I’ve never tried the TJ’s version. Just an fyi, the same company that owns aldi’s is also the largest “top secret” foreign owner of ti’s. You are probably buying the exact same product! If you have a save-alot in your area try theirs, 12.99 for a 5 lbs bag and they are good size!!! The convenience definitely pays for itself. I’ve used other bagged chicken. They always seem to shrink as o cooked them. Do these do that? I don’t think they shrink much, but doesn’t all meat shrink some when cooked? Yeah-just seems that the bagged kind shrank tons for me. ? You have to remember that things expand when frozen, so yes there will appear to be a little shrinkage when they cook, though I wouldn’t call it a ton with these. That would depend on the brand and how much solution they’re adding to the product. 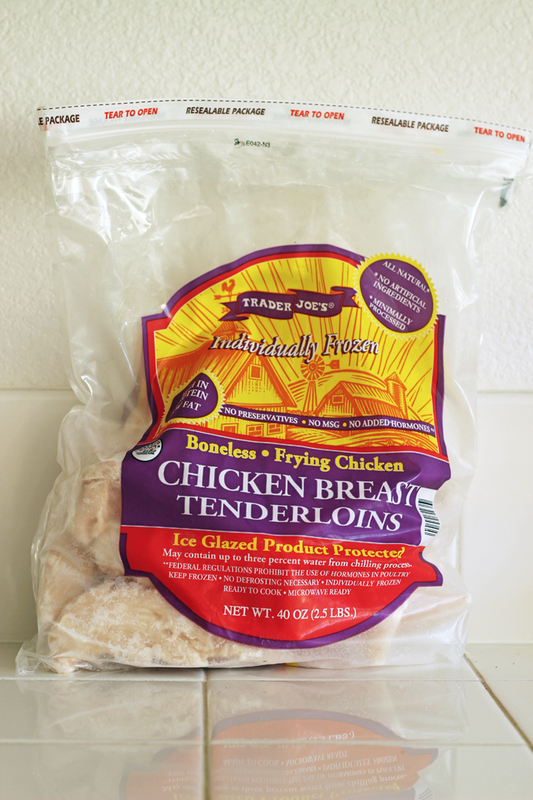 I tried TJ’s frozen chicken tenders after reading about them here, and now I try to keep a bag in my freezer at all times. I mainly use them for chicken salad, but I plan to try your cashew chicken recipe soon. I could have written that EXCEPT I’m a single and use them for everything. Two or three of them, depending on the size, are just right for me. I have some chicken breasts in the freezer but now use them only when I want to have a lot of cooked chicken on hand. Yes. My son cooks for himself to take lunch to school and that is another reason I love these. He can pull out only the ones he needs. Yay! Glad you’re enjoying them! I have not tried frozen, bagged chicken tenders because when I see a sale on whole chickens, I will buy several and then make my own tenders from the deboned chicken breasts. The ALDI and TJ info is great to know, if I’m low on tenders tho! Thanks for the tip! It used to be that I would buy bone-in chicken breast on sale, but I don’t see that very often these days. So, I alternate between these bags and whole chickens because I love to make my own stock. I will have to check our Costco and see how it prices out. Thanks for pointing that out. I buy the same chicken as Ann above me does. It’s slightly more than the fresh chicken I used to buy but saves money in the long run because I don’t have to purchase foil or freezer bags. The chicken always turns out great and it’s more portion sized so it saves a step. I have found that when I buy the big bags of tenders, breasts, or thighs from Costco, the meat gets freezer-burned. Do you know how that could be happening? I try to get all the air out of the bag, but it still happens. This time, I bought the chicken in the packets that have about 5 pieces in each section (making 5 at a time should work for my family). However, they were a bit more expensive and the meat will have to be defrosted before using, because the pieces are frozen together. I’d love any tips on this. Thanks! That sounds like your freezer might not be keeping a constant temperature. Is it being opened often? Also, perhaps store it in the deeper section of the freezer if that’s the case. If the convenience helps you eat at home, I’m all in. Are the tendons still in the ones at TJ’s? That is the reason I never buy tenders! Thanks so much for this email. 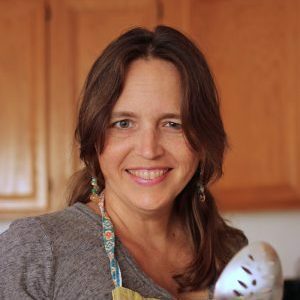 I tend to have an aversion to cooking raw chicken and a fear of not cooking it enough. I bought some of these tonight and baking them according to the package directions. Halfway through I sprinkled with your FishMama spice on some and just kosher salt on some (in case picky eaters didn’t like the spice mix.) They were great and so easy. I totally left them in way longer than I should’ve (above mentioned fear of under-cooked chicken) and they were still pretty good, probably better had I taken them out sooner. Even my picky 7 year old who will usually only eat chicken with some type of breading ate them and loved the spice mix! Thanks for helping me find an easy and healthy dinner everyone will eat. Will definitely try pan frying them sometime, but I have to say baking them from frozen was so easy and didn’t gross me out the way raw chicken typically does. Winner winner, chicken dinner! Yay! I am TJ’s from now on until …. well, something better comes along. I am SO GLAD to know I’m not the only one who thinks so! I used to have great success with Sprouts, but it’s been disgusting. “Disgusting” was actually the word I said after I ate the last Sprouts scallopini cut last night. I could barely get my teeth into it. And trust me – it’s not my cooking methods… this is happening a lot now with their chicken cuts. I accidentally bought the TJ’s chicken breasts recently and they were really good, too. Weird shapes, but good. How many tenders are in the bag? It’s 2.5 pounds, but the number of tenders varies. I’d say about 20? I have always bought the CostCo brand of these. I have not tried cooking without defrosting though. I can see the baking turning out ok, but what about frying? Do they spatter? I just tried these tonight and they aren’t great at all. Have you found a better source by any chance? Lately, I’ve been buying ALDI’s fresh chicken. It’s been very good. Do you have a recipe to batter and fry these to make fried chicken tenders?